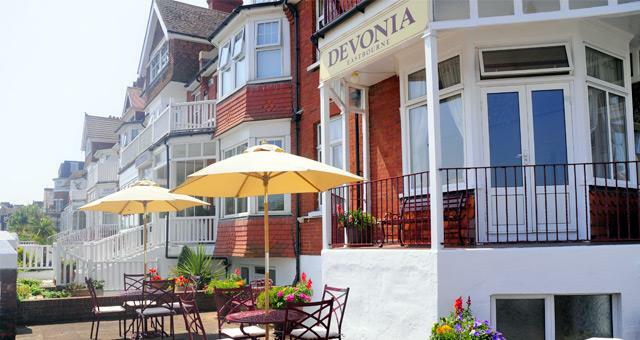 Devonia01323 720059work01323 720059fax Guest AccommodationDevonia is a charming Victorian property situated in a superb location on Eastbourne's elegant seafront. The resident chef/proprietor and his wife, Terry and Carolyn Jane, have many years' experience in the hospitality industry and will ensure you have a relaxing, enjoyable and comfortable stay at Devonia. Our guest bedrooms have flat screen televisions with Freeview, tea/coffee making facilities, hairdryers and toiletries. Most have a sea view and our superior room has a private balcony. There is a private car park at the rear. Free Wi-Fi internet connection is available 24 hours a day. Devonia is a non-smoking building. Breakfast is cooked to order and served in our light and airy ground floor dining room with delightful sea views. Check in time is from 12 noon but early/extra late arrivals can be arranged with prior notice. Check out time is 10.30am or later by prior arrangement. From Devonia you can stroll along the charming promenade to the Pier, past the colourful Carpet Gardens to the Bandstand - towards Holywell and the foot of the famous chalk cliffs of Beachy Head and the picturesque South Downs. 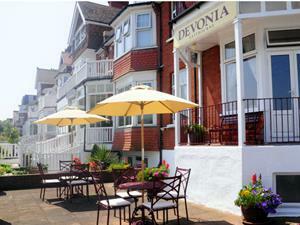 Devonia is a charming Victorian property situated in a superb location on Eastbourne's elegant seafront. The resident chef/proprietor and his wife, Terry and Carolyn Jane, have many years' experience in the hospitality industry and will ensure you have a relaxing, enjoyable and comfortable stay at Devonia. Eastbourne Town Centre, with its wide range of shops, bars and restaurants, is just a few minutes' walk away.. This was our second visit to the Devonia...Carolyn and Terry have a lovely guesthouse where you are made very welcome. Great breakfast sets you up for the day. We would recommend to anyone. Eastbourne a lovely town a the Devonia a great guesthouse. We will come back again! Thank you we are pleased you enjoyed your stay with us again. From the A27/A22 - follow the signs to Eastbourne seafront. At the Sovereign Centre roundabout turn right onto Royal Parade, Devonia is situated about 3/4 mile along the seafront on the corner of Addingham Road. The A259 coast road from Dover ferry terminal via Hastings is just over an hour's drive, as is Gatwirk Airport by rail or by road. There are regular rail and road services from London Victoria to Eastbourne railway station and National Express coach stop which are just a few minutes' taxi ride away. There are frequent bus services to explore Eastbourne and surrounding towns and villages.